College graduates with private student loans know the importance of staying current on their payments. But a new report by the Consumer Financial Protection Bureau finds that even consumers who pay their loans on time are finding themselves placed in default when the co-signer of their loan dies or declares bankruptcy. 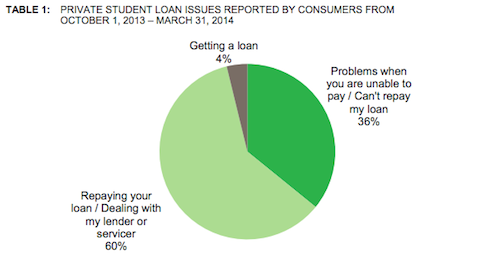 The CFPB’s recently released mid-year report [PDF], which analyzes more than 2,300 complaints and more than 1,300 debt collection complaints related to private student loans filed in the past five months, found many borrowers face significant challenges when it comes to working with their loan servicer to payback their debt. Nearly 60% of complaints involved problems communicating with a loan servicer regarding co-signers. The CFPB estimates that the combined total for federal and private outstanding student loan debt reached nearly $1.2 trillion in 2013. The majority of this debt is from federal loans, which borrowers typically take out on their own. However, when students need to cover a gap in tuition, they often turn to private student loans, which typically require a co-signer. In 2011, nearly 90% of all student loan were co-signed, typically by a borrower’s parent or grandparent. The practice of employing a co-signer can often lead to lower interest rates on student loans, because the co-signer is on the hook to pay the loan if the borrower can not. While many loan issuers advertise the option of releasing a co-signer from their obligations after a borrower meets certain requirements — often making a certain amount of on-time payments — consumers have reported it’s not an easy task. In one case, a borrower reported that at the time of origination, the lender stated they could release his co-signer after he made 28 on-time payments. however after making those payments, the borrower learned that 36 payments were required. After making the additional payments, he was told that 48 payments were now required. In other instances, borrowers reported that required forms were not available on websites or in electronic form. The inability to release a co-signer can often lead to unintended consequences for a borrower. The CFPB reports that certain situations or changes in the co-signer’s life — such as death or filing for bankruptcy — have significantly negative impacts on the loan borrower. Contracts often permit the lender or loan servicer to place a loan in default or accelerate the full balance of the loan upon the death or bankruptcy filing of a co-signer, regardless of whether the loan was in good standing. The CFPB consistently receives complaints from consumers who discover they are in default with their private student loans after their co-signer has died. While many consumer believe the death of a co-signer would result in a release of the co-signer’s obligations to repay, the simply isn’t the case. Instead of continuing to pay their loans as they normally would, borrowers reported they received notice to pay in full after a co-signer’s death. Additionally, borrowers whose loans are current filed complaints with the CFPB after receiving phone calls from debt collectors notifying them their loans are in default because their co-signer has filed for bankruptcy protection. Borrowers also reported they were unable to receive billing statements, pay for their loans online or request additional information once the co-signer’s bankruptcy proceedings began. While these automatic defaults are no fault of the borrowers, their consequences can be felt far in the future. 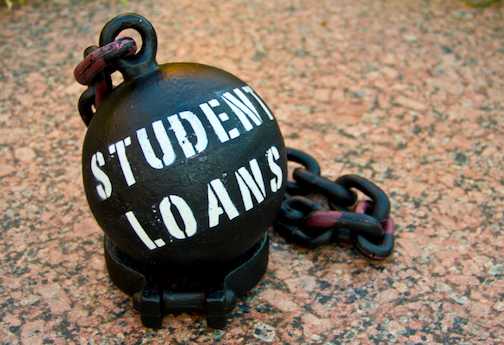 Student loan services are reporting these automatic defaults to credit bureaus negatively impacting the borrower’s credit profile, which, in turn, makes it challenging to qualify for future loans and purchases or even to obtain employment. Private student loans servicer can seek to determine whether a borrower qualifies for co-signer release and maintaining the existing payment schedule would be beneficial for all parties. The lender or servicer could provide the opportunity for the borrower to obtain another creditworthy co-signer. In many cases, the widowed parent or other relate may be a suitable substitute. The lender could notify the borrower the existing payment schedule will be honored for a designated period of time before the entire balance is demanded. This option would allow the borrower to apply for a new loan or to see a refinance option with a different lender with new terms.